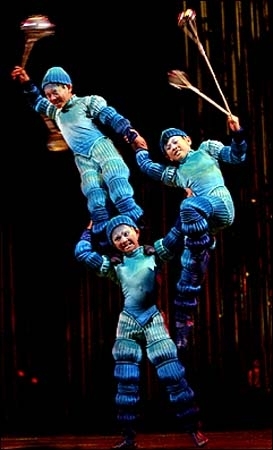 High above their heads, three young acrobats whirl ropes with metal meteors attached to the ends. 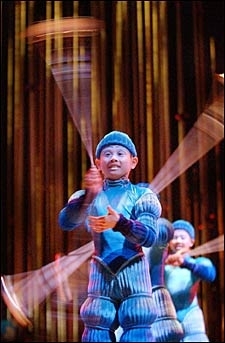 Handling their ropes with rare agility, they perform impressive acrobatic figures at the same time. A moment of poetic repose. Amidst the hostility of the forest, where forces conspire against Icarus and Olga, both in search of self-renewal, the Gatherers come as a pleasant downpour of emotion, a celebration of the elements. Three young boys receive meteors freshly plucked from the sky. To us, these are celestial bodies, full of power and portent. To the children, they are toys. What follows is a blaze of whirling light, with feats that defy both gravity and imagination. If Icarus was once a falling star, this is surely a symbol of redemption.